Xolani Luvono’s road to his first Ironman is one like few other. Less than 3 years ago Xolani (34) was a drug addicted begger, living under a bridge in Pretoria. Having grown up in the Eastern Cape, he unfortunately dropped out of school at a young age, got involved in gangsterism and drugs and ended up in jail for 5 years. In 2008 Xolani was diagnosed with bone cancer and his right leg had to be amputated. His disability and lack of education led to him moving up north and becoming a begger. However his journey didn’t end there, and took a remarkable twist. Against all odds he will now be lining up for Ironman Port Elizabeth! On 26 April 2016 (yes you read right, less than 3 years ago), Xolani was fortunate enough to meet Hein Venter at a robot, while Xolani was begging. Hein offered him a job at his perfume factory and organised accommodation for Xolani – this simple act of generosity stirred Xolani’s spirit, and inspired him to give up his drug addiction, start running and ultimately turn his life around. 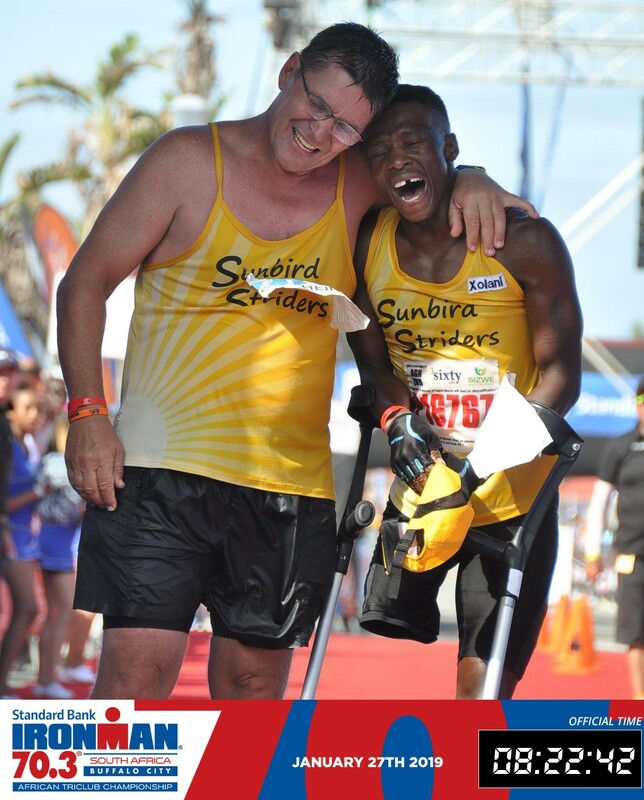 He has since has since completed the Comrades marathon in 2018 and also IronMan 70.3 East London in January 2019 in a time of 8h22! 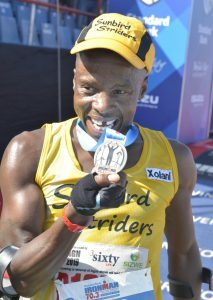 Now, only a few days before his first Ironman Port Elizabeth we got to speak to an excited Xolani! How has the training been going? I have been training very hard and have focussed on the swimming and cycling. Most mornings I start indoor cycling at 4am and then go swimming later in the morning. I have started doing open water swimming at Cradle Moon and have done a 4km training swim in dam recently in 1h47min and will try to go for 1h30 this weekend. We also do long rides in the Cradle, but should maybe have done more. I still run a lot as well and regularly do a few 21km runs a week. You’ve already completed Comrades, and we have to ask, which one was tougher? The Comrades was definitely tougher than the 70.3 as you get pain from using the same muscles for such a long time. Ironman 70.3 was hard work but not as painful, but I think the full Ironman will be tougher than the Comrades. I am running fit and can go do the Comrades tomorrow without fear, but I’m still a bit nervous about the swim, especially if there are big waves. How did you decide on doing Ironman? After finishing Comrades in 2018 I immediately thought – what is next? I love doing hard stuff and Ironman is as hard as it gets. 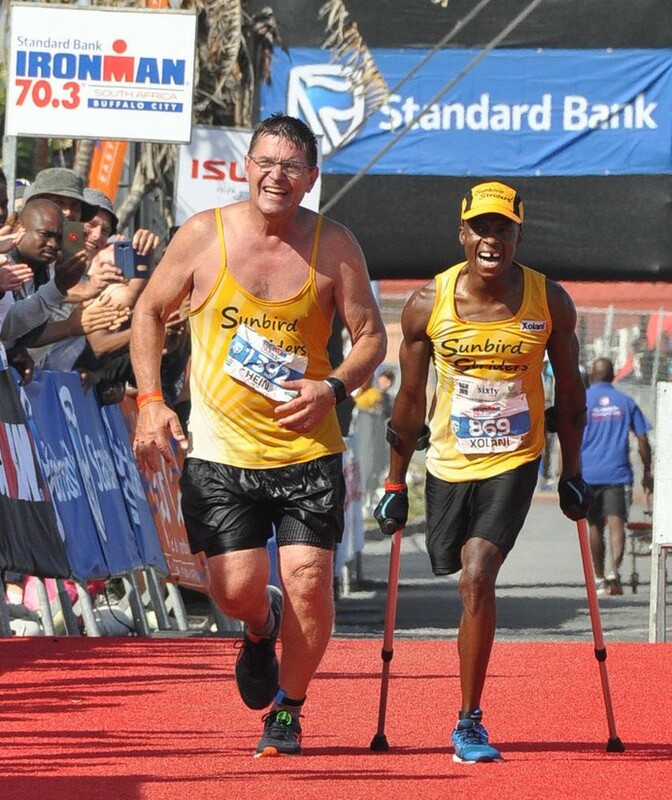 Being the first black amputee to finish the Comrades I also want to inspire other amputees and disabled people to complete the Ironman. That is my motivation. A lot of disabled people are often scared of the swim, and I am as well, but I hope I can inspire them to overcome that fear. Do you have a time in mind? [Haha] I will just be happy to finish within cut-off, even if its 22h40 if I make cut-off I will be so proud and happy. tough conditions, it makes you stronger and the memories last longer. Doesn’t your hands and shoulders get incredibly sore running so far on crutches? No, running is really easy for me. I’ve been doing it for so long that they are very strong, so for me its not a problem to run. Comrades finisher and an Ironman. and your heart. You must want it and then stay strong to achieve your goal. myself. I cannot miss the Comrades after doing it once, so will do that again as well! We end the call and say our goodbyes, before Xolani quickly adds: “Thank you again Meneer. You doing this story, makes me proud of myself. God bless you”. Xolani, you who make us all proud to be South African, inspires us and gives us hope. 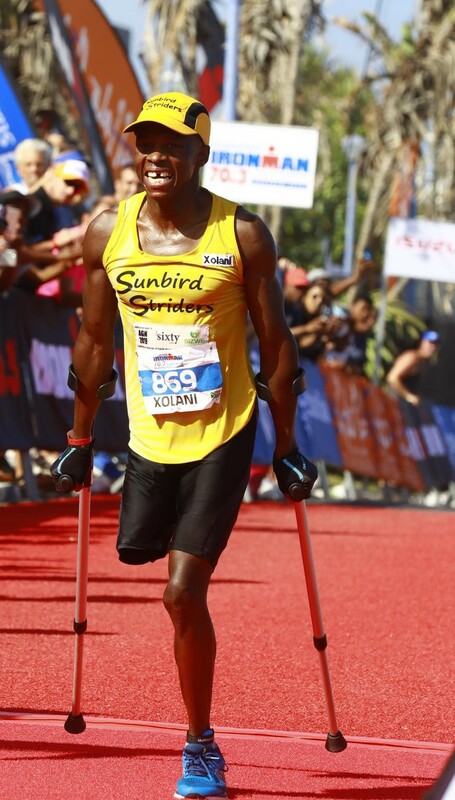 If you do spot Xolani out on the course, please do give him the support that this hero rightly deserves!